Ever liked to know what your cat did as it roamed the neighborhood the whole day long ? Now you can peek into the "other" life of your pet ! But don't be surprised to find out some secrets you never thought about when you watch at the recordings the CatCam made. The CatCam is a small digital camera that is worn on the collar of an animal to get deep insights of his life. 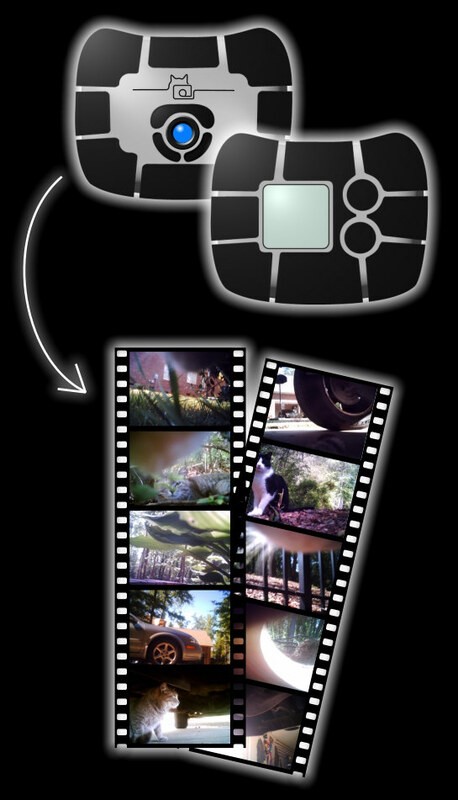 It takes automatically pictures or video clips in an adjustable time sequence/interval. This makes it also suitable for general surveillance tasks or time laps photography. If the automatic function is disabled the camera works as a regular mini digital camera. The completely new camera offers a 3 Megapixel image sensor and a numeric display for easier configuration. Image resolution is 2048 x 1536 pixels. It contains a rechargeable battery that will take up to 2000 images. The automatic mode recording interval can freely programmed between 2 seconds and 8 hours. This enables completely new features for innovative photography. Small size of 54x42x27mm (2.1 x 1.6 x 1 inch) and a weight of approx. 30 grams (1 oz). Connects to USB interface for charging and image transfer. A product designer helped us to shape the camera enclosure to a very appealing design. It does not only feel pleasant to touch it also sits snugly on your pets collar. The innovative mounting lugs allow multiple attachment methods like straps or snap hooks to attach the camera to the animal or just to your keychain. The CatCam has a quite long history and started with a fun project in 2007. On the bottom of this page you can see some examples of the media exposure of this idea. The camera has been hand built until we decided to start series production with this new version. Amongst others film maker Seth Keal made a short documentary of the CatCam idea and Mr. Lee. The 15 minutes movie won several awards. Visit the official movie website.